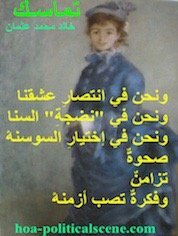 Read or Write About Sudan Good Articles or Comments, Receive Gifts! Readers Write About Sudan Good Articles! Readers write about Sudan good articles and comment on political topics continuously. The website has received already so many political articles and comments, so it becomes necessary to build this page as a site map. You and Me Could Make This Network Better than FaceBook! Since the readers have contributed most of the political content, so "write about Sudan" is now one of the secondary site maps in this network. It is the secondary site map number 21 an it is here to help you navigate easily to pages not included in the navigation bar. So, obviously, it extends the network with its top political pages and cultural pages. The readers have submitted their articles through the Content C.0, which serves the Web 2 on the Horn Africa's Network. We already have hundreds of comments, you can view through those site maps. The cultural pages now belongs to the HOAs Comprehensive Projects on this network, including the HOA's Cultural Project, the HOA's Journalists Project and the HOA's Poets Project. So, the extended Horn Africa's Network could involve you to do more than what you are doing on FaceBook. Why not create your own FaceBook here, but give it another name, or let us create a pen name for you free. At the end, you will see that you are doing better on this network. Sudan, the primary site map 7 A highlights the political situations, the social and political crises and analyses the political development in the Democratic Republic of Sudan. Well, is it a republic? Is it democratic? But, is there any state called Sudan nowadays? 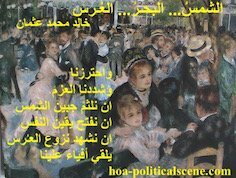 Sudanese Political Articles, the primary site map 7 B - The articles criticize the Sudanese dictatorial regimes and the Sudanese sectarian parties alike for the fraud and misleading of feudal, sectarian and allegedly religious leaders. Sudanese Arabic Political Articles, the primary site map 7 C - The Arabic political articles about Sudan are accessible on the Arabic HOA Political Scene. I found it interesting to build multi-lingual / bilingual pages on this network for those who couldn't read in other language than Arabic. Sudanese Economical Forums, the primary site map 7 D - The intention is to create those modern economical forums on this platform. They are not traditional or classic forums. I hope that you start any economical discussion about the economical policy of starvation of the so-called Muslim Brotherhood in Sudan. See the devil NIF. This is the decease of Sudan and will be for a long time until the people prove that they are still brave to clean their land from this garbage. 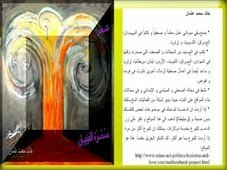 Sudanese Cultural Forums, the primary site map 7 E starts with Arabic poetry and short stories. 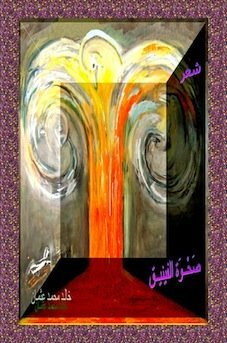 I published some of my short stories and other articles in Arabic through these forums on the network. Make sure to use them too. You could make literary contribution easily through the forms on the cultural pages, as you can use the same forms to comment on literary works published by me or other contributors in the network. Sudanese Forum, the primary site map 7 F - This is a political forum to write about Sudan and discuss Sudanese political topics. It is a space to support mass contribution, if done some day, so we could find the place ready to publish that contribution. Sudanese Forums, the primary site map 7 G includes some political pages about Sudan. The political articles are open to discussion. Contributions by those who confiscate the democracy in Sudan, or played a principle role to weaken the people are not allowed. Sudanese Regional Politics, the primary site map 7 H includes good updates of some pages on the network, some of which are Sudanese commentary pages. The Sudanese Regional Policy has always been conspiring against the neighboring countries, because Sudan has never had something called government since the independence of the country from Britain. Write about Sudan, the secondary site map 21 A is what you are reading right now. Consider it as Sudanese network organizer. Comments on Sudan, the secondary site map 21 B - Readers write comments on Sudanese political topics and reply to comments on this country to share their political views on this network and thus they built this site map. Sudan Online, the secondary site map 21 C shares political views on Sudan written by readers like you. You can comment on those entries on Sudan online or write political articles about Sudan. Sudanese Online, the secondary site map 21 D starts with introduction. It is also necessary to extend the site maps to absorb many of the pages and organize them following the method you see on this page. This structural process enhances rooting the structure of the network and forms it in a good architectural pyramidical shape. Sudanese Regime's Political Crimes, the secondary site map 21 E documents the Sudanese Military Religious Regime's political crimes and opens all to discussion. All in all, there are more than 33 site maps in the HOA Political Scene website. More than 14 of those site maps are primary site maps with supportive sub-categories published by me. More than 13 of these site maps are readers' site maps with sub-categories. Each site map indexes with relevant information different pages in this network to save your time and get you direct to the page you want to read, write or comment on it. In addition to "write about Sudan", you can find also all articles and comments that readers wrote about any state in the Horn of Africa through site maps on this page. So, this is why it is so important to take your time on "Write about Sudan" and get from it to any other country to read what writers have written about the political development of that country. 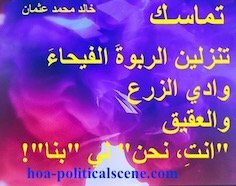 The visitors of the HOA Political Scene Blog and the loyal subscribers of the HOA Political Scene Newsletter love to write about Sudan and other states in the Horn of Africa because they trust the network. Thank you readers for making the HOA Political Scene Network authoritative source. The other articles writers wrote about other states in the Horn of Africa are included in the site maps in the leading links below the following note. The articles and comments writers wrote about Sudan or will write about Sudan fall just below these site maps. Note: If, you want to read more topics other than (politics) or to read about any city or town in any country in the Horn of Africa and write about it, please link to my daughter's website at 100 Beautiful Sites in the World. You can easily upload photos too from your beautiful city or town. See also one of the beautiful places in Sudan, such as Kordofan and one of the beautiful places in Ethiopia, such as Gondar and write about Any beautiful City here. If you want to contribute to this network and write about Sudan, use the form below. Please enter your name, location, email address and check the box that asks you if you want to receive notifications about replies to your article or comment. The system will not publish your email address. This automated system will send you only notifications to follow up. Did you know that you can also write poems, prose, short stories, novels, plays and critiques and publish using this network? Use the forms at the linked cultural pages to do that. Use the following form and the forms on the political pages to write about Sudan, or any state in the Horn of Africa. Comments on "write about Sudan" appear at the top of this paragraph and below the form. If you haven't done yet, please write about Sudan for the world to know. You can share "write about Sudan" with your social media services through the buttons on the page. If you don't have a service there, register for one free service. This could also be new experience for you to enjoy this communication technology on the Internet and learn from it. Thanks.